Blood, Bodies and Binaries: Tr..
One year ago, 14 East and DePaul’s chapter of the Society of Professional Journalists (SPJ) began remixing the Public Newsroom series, which originated at City Bureau, a nonprofit journalism newslab based in Woodlawn, a South Side Chicago neighborhood. Their Public Newsroom is a weekly event held on Thursday evenings, typically at Build Coffee. We remixed the Public Newsroom into a monthly event held in Lincoln Park. Since January 2018, we’ve held six public newsrooms and collaborated with the Better Government Association (BGA), The DePaulia, Radio DePaul and DePaul’s Office of Mission and Values. We’ve talked about Chicago government, sexual health, digital privacy, mental wellness, voting, and student media. We’ve taken risks, experimented with spaces and made a few mistakes. It’s easier to create its programming when you have identified the purpose of your event. Eager to start the series at DePaul, we launched ourselves into planning our first newsroom as soon as 2018 began. While we thought about the goals of our first event, we didn’t consider the goals of the series as a whole. This meant that we made quick decisions about location, timing and content that could have benefited from more reflection. After our second public newsroom, Andrea Hart, co-founder and community engagement director at City Bureau, suggested we establish the purpose, goals and objectives of our remix of the Public Newsroom. This something we would have done if we hadn’t rushed into organizing the event (we were really excited). So, we took a step back and identified that our goal is to foster a space that encourages discussions between guests, particularly members of the DePaul community, about important topics in the news affecting them here in Chicago. After determining this, it became much easier to identify newsroom topics, collaborate with others and develop programming. At our Public Newsrooms, we want to have a meaningful, engaging conversations with our community. What we’ve learned from organizing the series is that those conversations don’t just happen. It takes thought, intention, creativity and time to foster an environment that people — often strangers — feel comfortable talking about with one another. Our first few newsrooms fell short of this. For instance, we held our first few events in large classrooms designed for lectures. This set up encouraged guests to sit far away from each other and made the entire event feel impersonal. We thought bringing people together, including experts on a specific topic, was enough to stimulate conversation. It wasn’t. We structured our first few newsrooms as a panel, led someone from 14 East or SPJ. During our Public Newsroom on digital privacy, I moderated a conversation with Ally Marotti, a tech and business reporter at the Chicago Tribune and Matt Chapman, a former distributed systems engineer. The newsroom, predictably so, felt like a panel. However, when we restructured the event and invited our partners to lead the workshop themselves (like the BGA), we began to see more participation and discussion from everyone involved. We also moved our event off campus and into a smaller, conference room-style space to help stimulate conversation. It’s not about how many people come. Events are hard and college students are busy. It takes a lot (including free pizza) for them to make time for an event. We still struggle filling all of the chairs at our Public Newsroom — but that’s not the point of holding the event. We want to build relationships and have conversations with our community. If one person, who we haven’t met or worked with before, comes ready to have a discussion, then we have achieved our goal. As we grow, we’d love to have “regulars” and overfilled coffee shops. But for now, we’re happy with our staff, partners and a handful of students. Sometimes your plans don’t work out and you have to pivot. We carefully — and intentionally — planned our sixth Public Newsroom in November about the relationship between DePaul student media and the university. We invited the editors from The DePaulia, producers from Radio DePaul and DePaul’s spokesperson. We created four breakout sessions to be led by student reporters, and we moved the event off campus to Next Door Cafe to make it feel less like lecture and more like conversation. What we didn’t account for was that it was two weeks before finals week. Needless to say, outside of our staff and collaborators, not many came to the newsroom. For our programming, the majority of our guests needed to be from outside of the journalism realm. That wasn’t the case. So we pivoted. 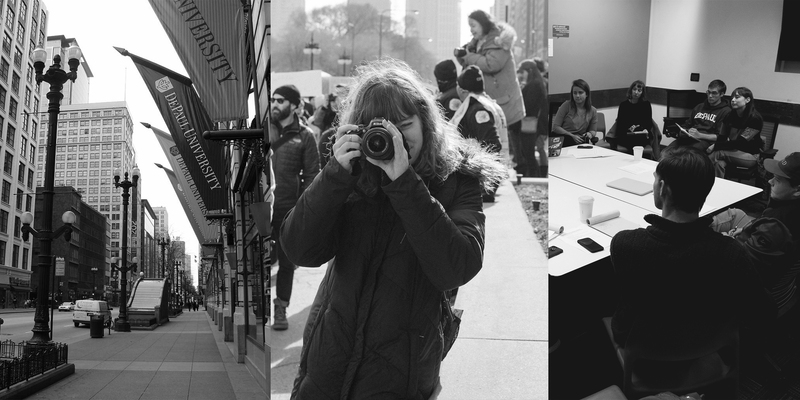 Instead of talking about stories student media has reported on DePaul, we talked about how student reporters, when covering DePaul, can do better and we explored avenues for cross-newsroom collaboration — which will be coming soon. Collaborations should be mutually beneficial. Though we found that Public Newsrooms are most successful when event collaborators lead the event themselves, we realized that this requires much more time and planning on the part of our collaborators. This means that the event needs to be helpful and make sense for everyone, not just 14 East and SPJ. When we approach organizations, people, or projects for collaborations, we ask what their goals are for the event and help make sure those are achieved as well. We’re proud of what we’ve done, but excited to see what comes next in our Public Newsroom series — and we want your help deciding what that looks like. Fill out the survey below to let us know what you would like to see this year in our Public Newsroom series.